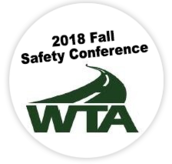 The Washington Trucking Associations (WTA) Safety Management Council will hold its 2018 Fall Safety Conference from November 1 – 2 in Yakima. 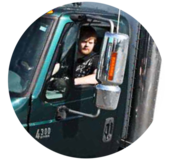 Now in its third year, the annual event is a great educational opportunity to learn about the latest safety developments in Washington State’s trucking industry. The two-day conference will feature a line-up of renowned experts from business and government. Vendor exhibits will also showcase the newest products to help keep your drivers safe on the road. For more details and registration information, please visit the conference website. Trucking is a risky business. Few people would argue otherwise. Interviews with injured truck drivers found that over half of all injuries occur at customer sites. Clearly, reducing trucking-related injuries needs to involve those sites. But how, when the sites are outside the direct control of the truck driver’s employer? Communication is the key to improvement. Make your concerns clear to your customers using focused, consistent communications that you repeat over time. 1. 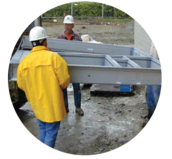 Talk with them about your concerns regarding the delivery bay. 2. Send copies of the attached checklists with invoices or other customer correspondence. 3. Communicate regularly, with reminders that safe deliveries keep their bays clear. 4. Thank customers for maintaining their bays. For your drivers, make sure they know that their safety is your priority. Talk with them regularly about safety at the customer site. The safety of your workers is a team investment — you, your workers, your customers. 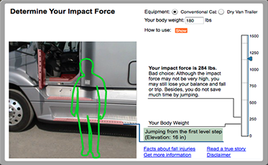 Together we can prevent injuries in trucking! A 33-year-old less-than-truckload driver from Tacoma was unloading his trailer by hand at a store. The store employees were not allowed to help, so he was unloading by himself. When he picked up an 80 lb. box, he felt a pop and pinch in his lower back. Then he could not stand up. He was diagnosed with a sprain to his lower back. The injury caused him to miss eight days of work. When jumping from the cab, top step, fifth-wheel or a trailer deck, it can increase your risk of injuring your joints, lower back and lower limbs. It also increases your risk of a slip, trip or fall. Slips, trips and falls cause many injuries in trucking. Changes in footwear, tasks and environment matter. Test your knowledge by clicking the slip simulation below.